The most common types of arthritis are osteoarthritis and rheumatoid arthritis, but there are actually more than 100 different types of inflammatory arthritis. According to the NIH, in 2012, more than 51 million people suffered from some form of arthritis. 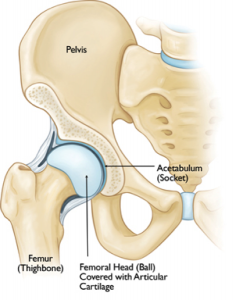 The hip is a “ball-and-socket” joint. The socket is formed by the acetabulum, which is part of the large pelvis bone. The ball is the femoral head, which is the upper end of the femur (thighbone). Rheumatoid arthritis is a systemic disorder, that is; it affects your entire body and not just the hip joint. The inflammation is related to an immune system response rather than wear and tear. The hip joint, like other joints in the body, is protected by a special capsule that completely surrounds the joint. This capsule has a special lining (the synovial lining) and is filled with lubricant (joint fluid) that helps the joint move smoothly. Rheumatoid arthritis typically causes a swelling of the synovial lining. This causes pain and swelling. Eventually, rheumatoid arthritis can cause the bone and cartilage of the joint itself to deteriorate. Rheumatoid arthritis can occur in people of all ages, including children (where it is known as juvenile rheumatoid arthritis), and is more common in women than men. Unlike osteoarthritis of the hip, which may occur only in one hip, rheumatoid arthritis typically occurs in both hips at the same time (and possibly other joints.) Rheumatoid arthritis is also associated with overall weakness and fatigue. Medications to treat rheumatoid arthritis continue to improve. Ankylosing spondylitis is a chronic inflammation of the spine and sacroiliac joint (the joint where the spine meets the pelvis) which can sometimes cause inflammation of the hip joint. Ankylosing spondylitis can occur in people of all ages, including children, and typically begins in a person between the ages of 17 and 35. It is more common in men than women. It is typical for people with ankylosing spondylitis to experience flare-ups when the condition is worse, followed by periods of remission with mild to no symptoms. Systemic lupus erythematosus or lupus is a systemic autoimmune disorder that can affect any part of the body, including the hip joint. If lupus strikes the hip, inflammation and damage to the joint can occur. Lupus can occur in people of all ages but it is most common in women aged 15 to 35. As the name sounds, this type of arthritis is related to the skin condition psoriasis. Psoriatic arthritis causes joint pain, swelling, and stiffness and can affect any joint in the body, including the hip. Most people with psoriatic arthritis have the skin condition first (scaly red patches of skin) but it is possible to develop psoriatic arthritis before the skin condition occurs. Osteoarthritis is a degenerative type of arthritis that occurs most often in people 50 years of age and older, though it may occur in younger people, too. 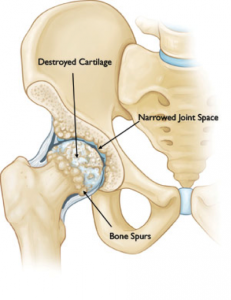 In osteoarthritis, the cartilage in the hip joint gradually wears away over time. As the cartilage wears away, it becomes frayed and rough, and the protective joint space between the bones decreases. This can result in bone rubbing on bone. To make up for the lost cartilage, the damaged bones may start to grow outward and form bone spurs (osteophytes). Osteoarthritis develops slowly and the pain it causes worsens over time. During your appointment, Dr. Heekin will talk with you about your symptoms and medical history, conduct a physical examination, and possibly order diagnostic tests, such as x-rays. In the x-ray of a normal hip (left), the space between the ball and socket indicates healthy cartilage. 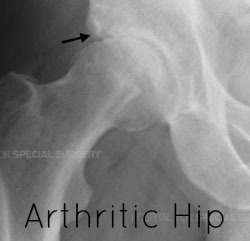 An x-ray of an arthritic hip (right) shows severe loss of joint space and bone spurs. 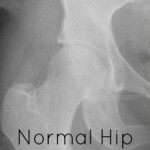 As with other arthritic conditions, early treatment of osteoarthritis of the hip is nonsurgical. Dr. Heekin may recommend a range of treatment options. Lifestyle Modifications: Some changes in your daily life can protect your hip joint and slow the progress of osteoarthritis. If needed, losing weight can reduce stress on the joint, resulting in less pain and increased function. Physical Therapy: Specific exercises can help increase range of motion and flexibility, as well as strengthen the muscles in your hip and leg. Dr. Heekin or a physical therapist can help develop an individualized exercise program that meets your needs and lifestyle. Assistive Devices: Using walking supports such as a cane, crutches or a walker can improve mobility and independence. Using assistive aids such as a long-handled reacher to pick up low-lying objects will help you avoid movements that may cause pain. Medications: If your pain affects your daily routine or is not relieved by other nonsurgical methods, Dr. Heekin may add medication to your treatment plan. Acetaminophen is an over-the-counter pain reliever that can be effective in reducing mild arthritis pain. Like all medications, however, over-the-counter pain relievers can cause side effects and interact with other medications you are taking. Be sure to discuss potential side effects with Dr. Heekin. Dr. Heekin may recommend surgery if your pain from arthritis causes disability and is not relieved with nonsurgical treatment. Total Hip Replacement: Dr. Heekin will remove both the damaged acetabulum and femoral head, and then position new metal, plastic or ceramic joint surfaces to restore the function of your hip. After any type of surgery for osteoarthritis of the hip, there is a period of recovery. Recovery time and rehabilitation depend on the type of surgery performed. Dr. Heekin may recommend physical therapy to help you regain strength in your hip and to restore range of motion. After your procedure, you may need to use a cane, crutches or a walker for a period of time.